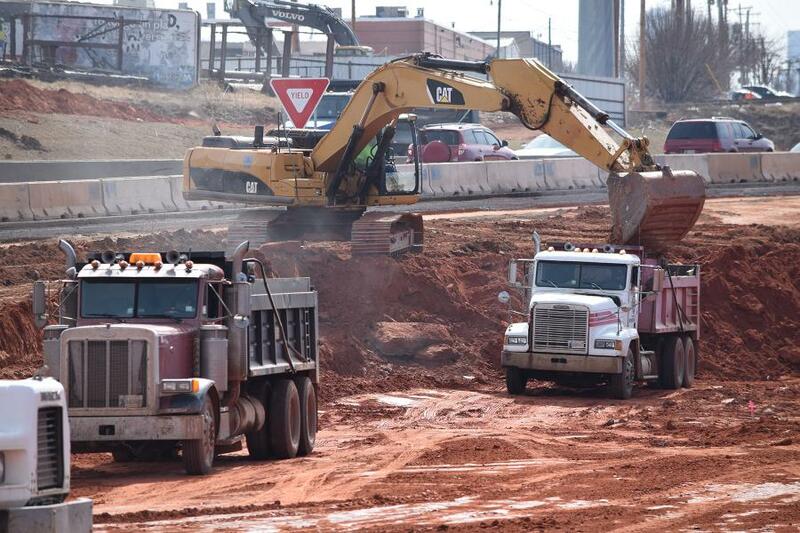 The Oklahoma Department of Transportation is project manager for a major road construction production titled “Off Broadway 44” in Oklahoma City, featuring an $81 million highway widening and bridge construction project. The current phase Off Broadway 44 — referred to as Act 2 — includes widening I-235 from four to six lanes from North 36th Street to just north of North 50th Street and reconstruction of the North 50th Street bridge over the I-235, the BNSF Railroad bridge and a smaller bridge near North 50th Street. All bridges will be widened to accept a six-lane highway with three lanes in each direction. In addition, the project features a sound wall that also serves as a retaining wall. Act 2 is actually Phases 4-A and 7 of the I-235 project — part of an ongoing multi-phased corridor expansion project scheduled for completion in 2022. When completed, it will provide relief for one of the worst bottleneck areas for traffic in the state. Work on the project began in early January and is slated to run through the end of summer 2019. The project is provided through 90 percent federal funding and 10 percent state funding. It will address congestion and safety issues by providing the additional two dedicated traffic lanes in addition to auxiliary lanes that will increase merging distance to accommodate current and future traffic. I-235 is a 5.4-mi.-long north-south highway in central and north-central Oklahoma City. It stretches from I-40 in the south to I-44 in the north. At I-44, I-235 ends, but U.S. 77 continues northbound as a freeway, called the Broadway Extension. This section of highway handles nearly 100,000 vehicles a day. I-235 also is known as the Centennial Expressway or the I-235 Central Expressway. It is a connector route and the Act 2 project will help ambulances get to major hospitals faster. The spur route of Interstate 35, I-235 was constructed in 1989. 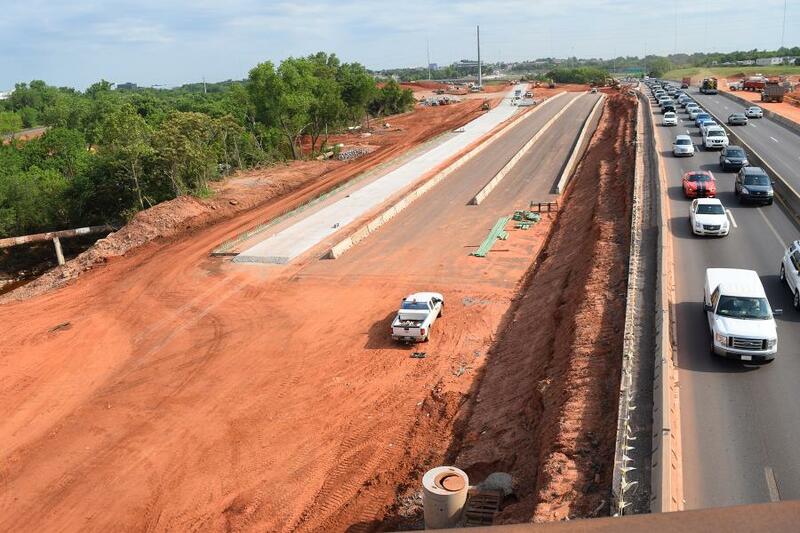 In concurrent project phases, U.S. 77/Broadway Extension is being widened to six lanes and I-235 will be reconstructed between north of North 50th Street through the I-44 interchange. In addition, crews will build flyover ramps and bridges on northbound I-235 to westbound I-44 and eastbound I-44 to northbound Broadway Extension. The contract for the current Act 2 work was awarded in May 2016 to Allen Contracting Inc. of Oklahoma City. It included incentives and a resurfacing project that prepared the interstate for the upcoming reconstruction. Allen Contracting, the low bidder for Act 2, has a $3 million incentive to finish the project early. When awarded, the $81 million contract was the single largest for a highway contract in state history. Allen has brought in national bridge experts to facilitate building the railroad bridge on site and moving it into place above the interstate. The Act 2 cast is made up of 65 to 80 workers from 18 subcontractors starring in this production daily. Headliners include Markwell Paving Company Inc. of Oklahoma City; Traffic & Lighting Systems LLC of Oklahoma City; Shell Construction Co. Inc. of Oklahoma City; American Bridge Company of Coraopolis, Pa.; Action Safety Supply Co. of Oklahoma City; L R Toby Trucking Co. of Oklahoma City; Gary A Crain Inc. of Prague, Okla.; Krapff-Reynolds Construction Co. of Oklahoma City; El Reno Sod of El Reno, Okla.; Hayward Baker of Hanover, Md. ; MCL Contracting LLC of Richland Hills, Texas; Crimson Steel Supply of Tulsa, Okla.; AR Daniel Construction Inc. of Cedar Hill, Texas; AH Beck Foundation Co. of San Antonio, Texas; Redlands Contracting of Edmond, Okla.; American Fence Co. Inc. of Phoenix, Ariz.; Keystone Service of Bixby, Okla. and Redlands Surveying Inc. of Moore, Okla.
Current construction includes some widening of Highway I-235, demolition of the 50th Street bridge and assembly of the truss structure for the new BNSF Railroad bridge. Equipment in use at the construction site includes cranes, bull dozers, backhoes, delivery trucks, concrete pavers, tunnel boring machines and excavators. Various sizes of cranes will be needed. “They get larger as we build the railroad bridge,” said TJ Dill, ODOT Division 4 maintenance engineer. The Act 2 project will require about 1,700 cu. yds. of concrete and about 6,600 tons of asphalt, Dill said. The process of demolishing the North 50th Street bridge and the BNSF railroad bridge, as well as moving the new railroad bridge into place, will require as many as six, separate full weekend closures of I-235 for traffic safety. Crews are unable to demolish the bridge with I-235 traffic beneath it. 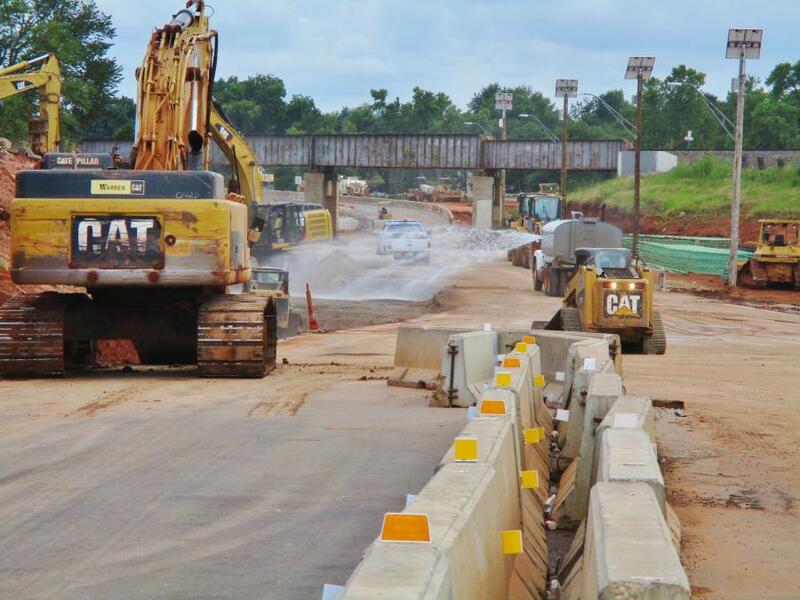 Regular traffic advisories will update motorists to lane closures and lane shifts throughout the project. 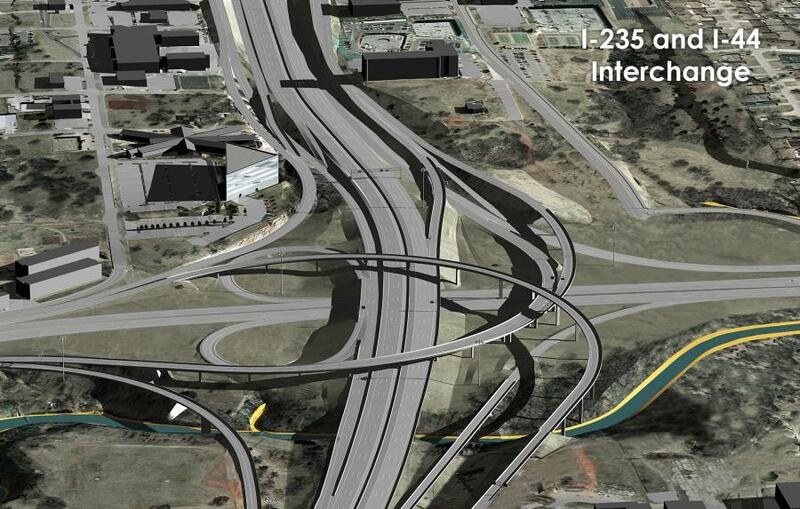 Some work will be done at night to minimize impacts on I-235 during the project, Dill said. ODOT has completed the first of the six full closures of I-235. It went smoothly with the interstate reopening more than 24 hours earlier than anticipated. The next full closure is anticipated in early 2018. Otherwise, I-235 will remain open to two lanes in each direction with the exception of some limited narrowing to one lane in the fall as preparation work is completed for the new railroad bridge center pier. “This probably will occur in late September or early October,” Dill said. Dill reported that the project has had no major delays. He said the design phase of the project was challenging because it required extensive coordination prior to construction.